How Did The Clintons Outlast The Gores? Much is sad about the divorce of Al and Tipper Gore, but one thing is truly shocking: while these two are splitting up, the Clintons are still together. When Monica Lewinsky was making headlines in 1998, plenty of people wondered if Bill and Hillary's marriage was over. 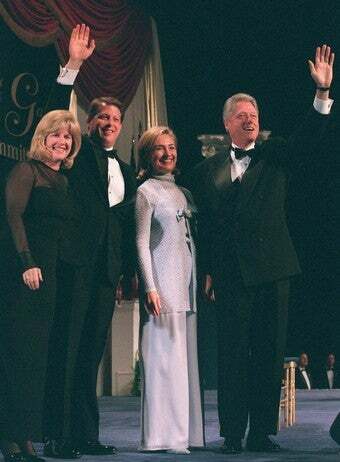 But in the same few weeks that Al and Tipper Gore announced the dissolution of their 40-year marriage, Bill Clinton told the graduating class at Yale that "I'm grateful because if I hadn't come here I would have never met Hillary" — and despite many very public troubles, the two remain hitched. If, as a friend of theirs once said, "The Clintons are complicated because they stayed together," the Gores are now complicated because they split up — and both couples have subverted our expectations. In her funny-sad elegy for Al and Tipper's relationship, Rebecca Traister writes, "they were supposed to be the functional couple. The ones who personally disapproved of the cigars and the thongs and the rest of the ridiculousness so mightily that they eschewed the Big Dog's help in 2000 and look what happened!" And: "It had never occurred to me that it would bother me in the slightest if Al and Tipper Gore got a divorce mostly because it had never occurred to me that Al and Tipper Gore would ever get a divorce." The Gores just seemed reliable — a sweet and wholesome alternative to the Clintons' Sturm und Drang. And yet, if their famous PDA was any indication, they were also passionate. A high school teacher of mine even told us that Al responded to Bill Clinton's infidelity with the witty/icky line, "Nobody touches my zipper but Tipper" — the Internet, perhaps mercifully, appears to contain no trace of this. It is fascinating . . . how he and his wife had a very complicated relationship. They loved each other very much. They had a bunch of kids, but they had big pockets of estrangement between them, and pain, and they rendered enormous service to this country because they stuck with what they had in common. Though we'll never know exactly what goes on with the Clintons, two popular explanations for their "complicated relationship" have emerged. One is cynical: they stayed together for his career in the nineties, and now they're staying together for hers (Miller writes that "Hillary has encouraged this endless dissection of her marriage because she seems to want it both ways: she wants to run and win as her own woman and she wants to offer her years as First Spouse as 'experience'"). The other is more nuanced: that although the Clintons have had serious problems, they retain a "shared love of politics – the intellectual and emotional bedrock of their relationship," that may still translate into love for each other. Democratic fundraiser Chris Korge told the Times in 2006, "Who knows how any couple conquers the issues in their marriage, but they did it. It's like when he bought her a new diamond ring recently, you just saw the look in her face." It's certainly possible — the Clintons are two very smart people with powerful shared interests, and the means to pursue those interests to the fullest. At this point in their marriage, that may be enough. The Gores, by contrast, seemed to have what every political couple claims to want — the privacy to enjoy each other's company, coupled with the freedom to work on their own projects (they also weren't hurting for cash, with their net worth in 2007 estimated at $100 million). There's little clue yet as to what went wrong after 40 years, but if their sad revelation teaches us anything, it's that even marriages lived in the public eye are mysteries to all but their participants. And perhaps that whether a couple stays together or splits apart may have less to do with fidelity or even love than with whether each person's unique expectations for the relationship are met. But enough with the philosophizing: somebody please tell us the Obamas are okay.